^ Ramusack 2004, p. 87 Quote: "The British system of indirect rule over Indian states ... provided a model for the efficient use of scarce monetary and personnel resources that could be adopted to imperial acquisitions in Malaya and Africa. (p. 87)"
^ Markovits, Claude (2004). 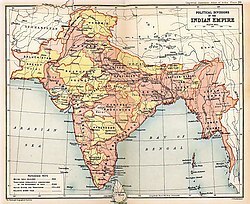 A history of modern India, 1480–1950. Anthem Press. pp. 386–409. http://books.google.com/books?id=uzOmy2y0Zh4C. ^ Great Britain. Indian Statutory Commission; Viscount John Allsebrook Simon Simon (1930). Report of the Indian Statutory Commission .... H.M. Stationery Office. http://books.google.com/books?id=KTEoAAAAMAAJ 2012年6月9日閲覧。. ^ All India reporter. D.V. Chitaley. (1938). http://books.google.com/books?id=KWI2AAAAIAAJ 2012年6月9日閲覧。. Exclusively on Indian princely states and domains.